One of the most difficult things to do in the creative world is to find a way to organize all of your tasks. There are lots of techniques and applications available, and I have tried quite a few (using post its, creating documents with lists, setting things a calendar appointments,) but it's hard to find one solution that covers all the bases. So instead I use a handful of different apps for different purposes. Here are a couple that I like. After trying The Big Pic, I've discovered a similar and better alternative that comes as part of Google's product-line. Google Keep allows you to create color-coded tiles, much like post-its, and also offers a check list function. It's a great general To-Do application. It comes standard with Android as an app, but is not available as an app for iOS (still you can simply save it as a web-page on your iOS home screen and treat it like an app). You can also tag the tiles with a theme – for example: “Beach Trip 2015”. Then when you view only tiles with a certain tag, it' a great way to organize you're projects. Google Keep is great for the basic stuff, but if you need a task manager with a little more depth I've found two other options that I think offer quite a lot. And since I've used The Big Pic and Google Keep to plan for past vacations, so I thought I'd try out these two new apps to plan this year's upcoming vacation. 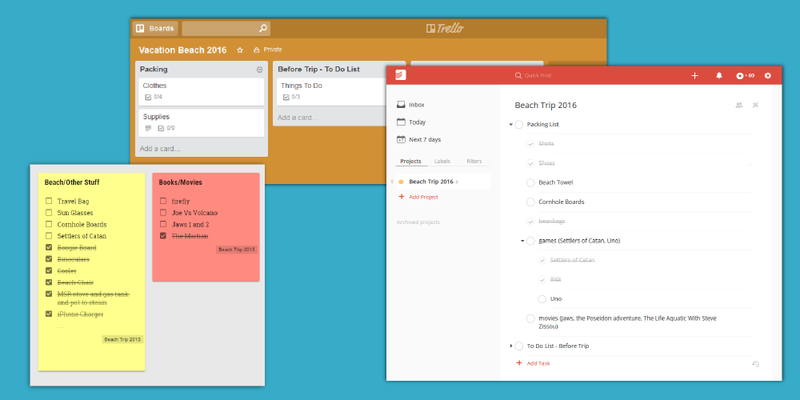 ToDoist is a great tool for creating in-depth check lists. The app lets you easily create projects that contain lists, and by hitting the control and left or right keys, you can nest lists within lists, which provides a great way to organize components of a project. The interface is very clean and simple. The app lets you set due dates/reminders so you'll get emails reminding you when tasks are due. The paid version allows for collaboration and added storage for files. Overall, its a great option for managing projects. Trello is looking like my favorite overall task manager lately. Like Google Keep and The Big Pic, Trello provides a very visual format for organizing information, it being based on Toyota's Kanban style of task management. Tasks are organized as cards on lists, which are then organized into projects. Note: Trello is from the same people who created Stack Overflow, one of the best web development question and answer boards out there. Both ToDoist and Trello are great task management applications, and both offer free basic accounts, are availabe as apps, and the ability to share with other users (though, with ToDoist you'll have to pay for that feature). If you prefer clean tidy lists, then you may prefer ToDoist. If you're more of a visual person, then you may prefer to use Trello. The only way to know for sure is to try one out.